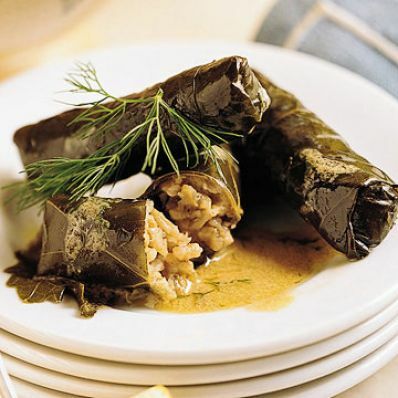 1 of 3 Boil grape leaves in 6 cups boiling water until tender, 20 to 25 minutes. 2 of 3 In second saucepan, saute onion in butter 3 minutes, until slightly softened. Add garlic and cumin; cook 2 minutes. Add beef; cook, breaking apart with wooden spoon, 5 minutes. Add rice and mint; cook, stirring, 3 minutes. Add water, salt, pepper. Simmer, uncovered, stirring, 7 minutes. Cover; simmer 13 minutes. 3 of 3 Whisk flour and 1/2 cup water in small cup. Add to rice; cook 2 minutes. Remove from heat. 1 of 5 Mix juice, dill, salt, pepper, sugar and mustard in bowl. Whisk in oil. 2 of 5 Drain leaves; rinse with cool water. Add 1/3 cup dressing to rice. 3 of 5 Place steamer or steamer insert in large pot with 2 inches of water. 4 of 5 Lay 1 leaf flat, smooth side up, on work surface. Place 1 tablespoon filling on center of base of leaf. First fold over one side of leaf, then fold over other side. Beginning at bottom of leaf, roll up tightly to leaf point. Place, seam side down, into steamer basket. Continue with remaining leaves and filling. 5 of 5 Steam 35 to 40 minutes, until tender. Remove to platter. Drizzle with remaining dressing. Makes 4 dozen.